A special kind of magic comes to Walt Disney World in December, when the holiday decorations go up and the resort takes on the air of Christmas. The Magic Kingdom closes early a dozen times during the first half of December, only to transform and reopen an hour later for Mickey's Very Merry Christmas Party. For a separate admission fee, up to 25,000 guests have five hours to consume free hot cocoa and cookies, hear storytellers, watch fireworks, shows and parades, pose for free photos, meet characters, and visit attractions. As it was during the day, Town Square was decked out in its Christmas finery. A giant artificial Christmas tree (a real one would die well before all of the decorations were installed on it) towered over a small train set—a miniature replica of Walt's Carolwood Pacific backyard train set—and a pile of gifts. Huge candy canes made of red and white balloons decorated the walkways through the square. Christmas music filled the air, and “snow” fell along Main Street, which was decorated with garlands and wreaths along its length. Main Street, facing toward the Christmas tree in Town Square, is decked out in holiday lights and garlands. Photo by Mark Goldhaber. Most attractions were open throughout the park. The only attractions normally open after dark that were closed were the Walt Disney World Railroad, Swiss Family Treehouse, Enchanted Tiki Room Under New Management, Jungle Cruise, Liberty Belle riverboat, Hall of Presidents, Carousel of Progress and all of Mickey's Toontown Fair. Due to the limited number of tickets sold, the waits on lines appeared minimal. 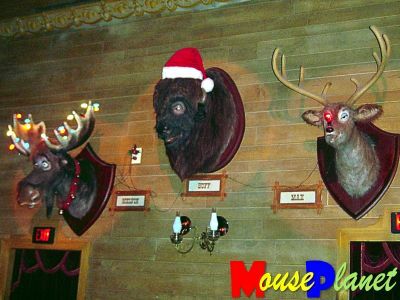 At the Country Bear Christmas Special, Melvin, Buff and Max are decorated in the seasonal style. Photo by Mark Goldhaber. Those in the mood for a seasonal treat could get free cookies and cocoa at the Plaza Pavilion in Tomorrowland, and at the Diamond Horseshoe and the Columbia Harbour House, both in Liberty Square. Free photos were also available at Timekeeper in Tomorrowland and the Agrabah Bazaar in Adventureland. A children's party, the Fantasyland Holiday Hop, took place at the tent area in front of Ariel's Grotto, and the Lake Howell Holiday Brass performed on the Tomorrowland Stage. The Country Bears are all outfitted to celebrate the season. Photo by Mark Goldhaber. Several characters were out and about, with nine staged greeting areas. Many of the characters were dressed for the occasion in festive Christmas outfits. Santa himself was also available for greetings and photos back in Town Square, adjacent to City Hall. 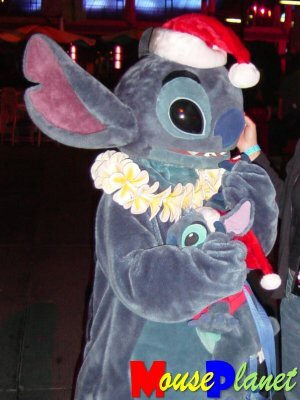 One of the characters meeting and greeting partygoers was Stitch, who takes a liking to a miniature Santa Stitch plush brought to his attention. Photo by Mark Goldhaber. A special performance of the “Wishes” fireworks show included some extra “surround” bursts, where several blasts of fireworks were shot from additional locations that surrounded the Magic Kingdom (although the burst that should have taken place behind the Main Street Train Station did not fire on the night that I attended). Unfortunately, the show did not include a special segment with seasonal music. Donald and Daisy take over the skating rink float to promote “Mickey's Twice Upon a Christmas.” Photo by Mark Goldhaber. “Belle's Enchanted Christmas” storytelling was presented five times in the Fairytale Garden in Fantasyland. The seasonal entertainment feature was just one of several entertainment options that were available only to Christmas Party attendees through December 17 that would then become available to all park guests during regular hours beginning December 18. Recently, much of the holiday entertainment available during Mickey's Very Merry Christmas Party has been made available for regular park guests. This has resulted in some event guests complaining that they were not getting enough value for their money—not only had they already seen the entertainment during the day, but they had to pay an additional fee to attend the event. In addition, 25,000 tickets sold for each event made for a considerably more crowded evening than the old E-Ride nights, which were limited to 5,000 guests. 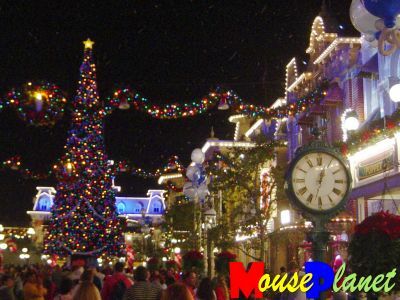 To address this complaint, Disney decided to make the special holiday events available only to Party guests during the first part of the month, then cutting off the Mickey's Very Merry Christmas Party events on December 17 and opening the entertainment to all guests beginning the next day. 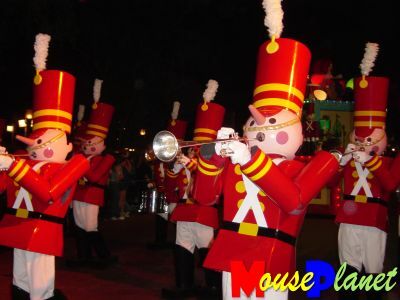 The wooden soldiers make their traditional Christmas Parade appearance. Photo by Mark Goldhaber. 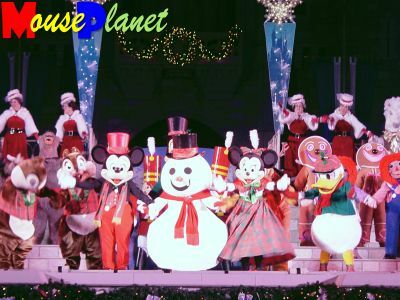 The headline entertainment was Mickey's Very Merry Christmas Parade, run twice during the evening. The parade featured the same floats seen during the national television broadcast plus additional floats not on the show. Perhaps due to its running at night, the parade seemed to have a more intimate feel. As is standard these days for nighttime parades, it was led by a platoon of “glow carts,” those rolling vending carts that sell glow-in-the-dark merchandise such as spinny lights, necklaces, and flashlight-based toys. Featuring the traditional holiday floats, it was largely the same parade as the past several years. 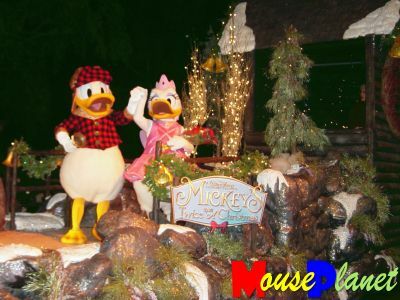 This year, the ice skating float was populated by Donald and Daisy to promote the Mickey's Twice Upon a Christmas video, while Snow White was moved from there to a float featuring the dwarfs' cottage. 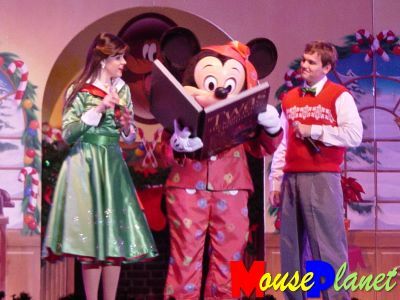 Mickey begins reading 'Twas the Night Before Christmas at his show of the same name. Photo by Mark Goldhaber. 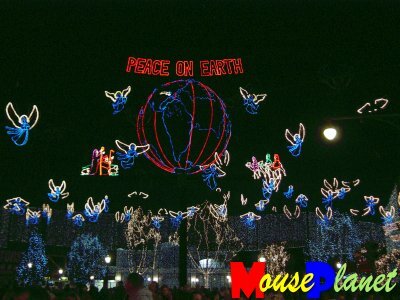 Another major event was the Mickey's 'Twas the Night Before Christmas show, staged five times during the evening at the Galaxy Palace Theater. The show—which may be the first time that I've seen Mickey and Minnie in bed together—was extremely well staged, with scenery that was extraordinarily well planned for easy and quick scene changes. The songs were well done and the singers and dancers did a nice job with them. There were also two Nutcracker numbers, with one featuring Brer Bear, Baloo and one of the Country Bears along with the Sugar Plum Fairy. There were also a rocking rendition of “Run Run Rudolph” and a strange moment of Minnie singing “Santa Baby” to Santa Goofy, which made me wonder where Mickey was and what he thought of Minnie's number. The Sugar Plum Fairy dances past Mickey and Minnie, who are sitting in bed together. Photo by Mark Goldhaber. The Celebrate the Season show was performed in front of Cinderella Castle three times during the event. The show was well done, and featured segments in which the Disney characters gave each other gifts. When Minnie opened her gift, several people noted that the ballerina who appeared seemed to look quite a bit like Nutcracker Barbie. 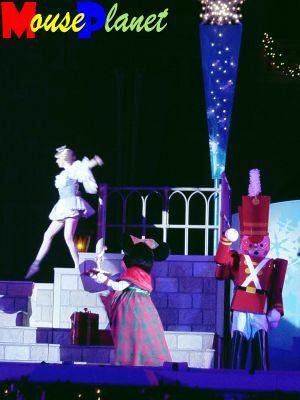 Her Sugar Plum Fairy number was followed by more Nutcracker dances, including a Chinese Dance number, and a Russian Dance number that was performed by three of the Country Bears. The show included some more numbers featuring the classic Disney characters, and concluded with “snow,” fireworks and confetti. 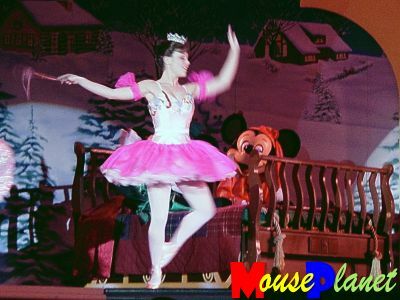 Minnie looks at her gift, which appears surprisingly like "Nutcracker Barbie," during the "Celebrate the Season" show. Photo by Mark Goldhaber. The cast of Celebrate the Season show begins gathering for the finale. Photo by Mark Goldhaber. If you go in future years, be aware that Friday nights seem to sell out early. Other nights did not sell out this year. 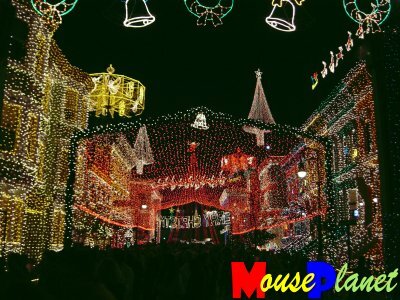 After a year off following the initial demolition of Residential Street at the Disney-MGM Studios, the Osborne Family Spectacle of Lights has returned this year. They have been installed on the recently reworked Streets of America backlot. It seems that they have managed to squeeze the millions of lights into a space that is much too small for them. The static displays, which were formerly set off by themselves so that they were easily seen, are now placed on the street directly in front of the walls of light, making it much more difficult to see the images clearly. A few people had commented to me during the week that the display had gone from the “Wow, that's pretty” of previous years, to “Wow, my eyes hurt!” Due to the overlapping displays and general visual intrusions of one display upon the next, I have taken to calling it the Osborne Cacophony of Lights. The wall of lights behind this display makes it much harder to see clearly. Photo by Mark Goldhaber. The overlay of display upon display creates more of a synaptic overload than a harmonious appearance. Photo by Mark Goldhaber. 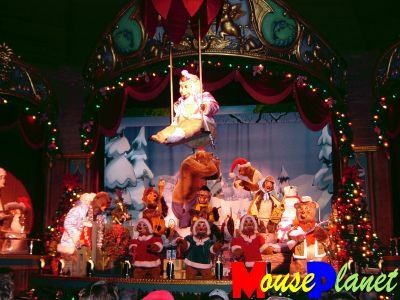 The daily parades at the Disney-MGM Studios and Disney's Animal Kingdom underwent modifications to a holiday theme, basically adding holiday decorations to the existing floats and adding Christmas lyrics to the parade theme songs. The Disney Stars and Motor Cars Parade at Disney's MGM Studios became the Hollywood Holly-Day Parade, while Mickey's Jammin' Jungle Parade became Mickey's Jingle Jungle Parade at Disney's Animal Kingdom park. Back in Epcot, the famed Candlelight Processional again featured a celebrity narrator telling the story of Christmas, backed by a massed choir of Disney cast members and local singers. In addition, the holiday storytellers again gave an international take on the holidays, from the various incarnations of Santa Claus (Papa Noel, Father Christmas, Pere Noel, Julenissen, and so forth) to Taarji in Morocco, The Monkey King in China, the Daruma Vendor in Japan, and Hanukkah and Kwanzaa storytellers at the American Adventure. The angel display at the courtyards is the rare portion of the Osborne lights that is actually tranquil and pleasing to the eye. Photo by Mark Goldhaber. At the resorts, holiday confections were the order of the day, as all of the deluxe resorts featured edible holiday decorations of the largest degree. Among the featured delights were a gingerbread and chocolate carousel at the Beach Club, a life-size gingerbread house at the Grand Floridian and an exotic gingerbread village with volcanoes and edible palm trees at the Polynesian. Early December is a great time to see the holiday decorations and events around Walt Disney World, without the huge crowds that show up during the last two weeks of the year. 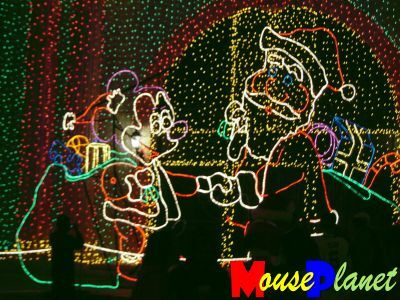 The events that run only the last couple of weeks can mostly be seen at Mickey's Very Merry Christmas Party, so you can go to the Party and not miss any of the special holiday events.